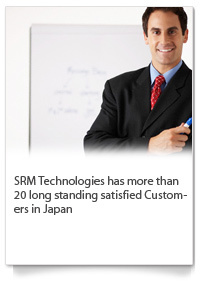 SRM Technologies, Inc. is a leading, global provider of software outsourcing services specializing in application software development, systems integration, web services, mobile and embedded solutions development, technology consulting and project management services. Founded in 1999, the company has grown to over 350 professionals with Global Headquarters in Chennai, India, and Regional Headquarters in the United States, Japan, Singapore and Dubai. Committed to delivering quality projects, services and solutions, SRM strives to get better continuously in all its practices. With our unique development process and delivery method supported by the excellent onsite, offshore development methodology, we offer high quality, cost- effective, offshore based IT services to our clients, the world over. Our consulting services provide a vital link to the customers in supporting their business strategies. We provide project based consulting and professional services, our consultants add value in optimizing the process that leads to increased productivity. Copyrights © 2007 SRM Technologies,Inc. All Rights Reserved.